We value our patients' experience at Beach Chiropractic. If you are currently a chiropractic patient, please feel free to complete the following Client Experience Questionnaire. The Questionnaire is in Adobe Acrobat format, and requires the free Acrobat Reader to view. My Australian Sheppard named Foster was my sofa buddy. He loved to hop up on the sofa and watch TV with me. 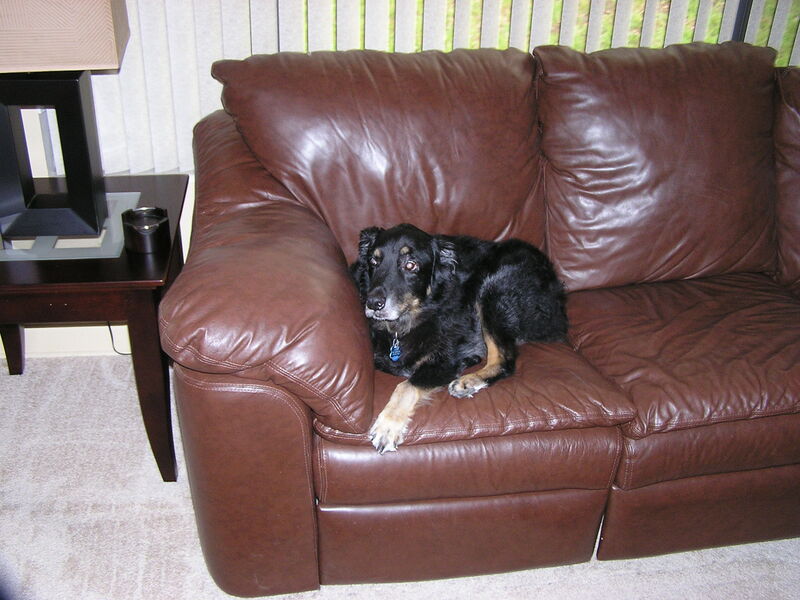 Over the years he developed hip and spinal issues which got so bad that he was no longer able to get up onto the sofa unassisted anymore. For years I tried everything I thought I could to help my buddy, but nothing seemed to help. Dr. Robben started treating foster with Chiropractic Care; I was totally surprised when suddenly he started jumping up on the sofa!!!!!! I am grateful to Dr. Robben for improving his quality of life in his golden years! I have been very happy for two years, to have found Christa Robben D.C., at Beach Chiropractic. "Checkers", my 7 year old little ShiPoo, has developed back problems and she has given him much relief with her treatments. Dr Christa is very professional, kind and patience with "Checkers" and me. I give her excellent marks and recommend her skills to others pets. to my body. 5 Stars!" "Great staff, great service. Got an adjustment, therapeutic ultrasound and some electrode therapy, happy back. 5 Stars!" "Dr. Christa Robben is very knowledgeable of her profession. Laid back but professional (pun intended). Her staff is kind and helpful. I highly recommend her for not only chiropractic care but also nutrition information. 5 Stars!" "Dr. Christa and her staff love what they do and it shows. I have suffered with neck and back issues for years, and have made huge strides in the right direction under their care. But they don't just treat symptoms, it is a total wellness program. They have proven I can trust them to care for my overall health. I'm so fortunate to have been referred to them! 5 Stars!" "Dr. Christa provides the best chiropractic service I've had in town. The entire staff is very friendly and great to deal with. I always leave satisfied that I've had the best quality care I could get, with a lot of little extra touches that come with the treatment. And she also carries a great supply of additional health care items and can explain their essential benefits. I would highly recommend a visit. She's awesome! 5 Stars!" "I love going to Beach Chiropractic! Before I started going in May, I was having trouble walking without being in pain, but after going I always leave feeling in top shape. Dr. Christa is very friendly and gentle, making sure that her patients are comfortable as they are adjusted. I'd never thought of going to a chiropractor at age 18, but I think Beach Chiropractic is the best choice for all ages! 5 Stars!" to Christa's treatment. I recommend Beach Chiropractic to EVERYONE! my quality of life. Your the best!! 5 Stars!" "My husband and I had just relocated to Cocoa Beach and have in the past received ongoing care, so we were hoping to find someone to continue the great care we received back home in Iowa. We are both very happy with choosing this facility based on Googling what was in the area. Very thorough in assessing my concerns and needs and took great care in correcting my issues. Bonus, was to find that in the back of the house they also offer massages and acupuncture services. Use of essential oils and other wellness products available! When inquiring about where to go for dental services, found that her father practices right in that same office..BINGO! VERY IMPRESSED!!! 5 Stars!" "I have been to many chiropractors, and Dr. Christa ranks as one of the best. She uses a gentle, yet effective technique that results in quick improvement. The adjustments are always tailored to the needs of the patient. I've also seen Suzy for a massage, Dr. Eric for acupuncture, and they too are high quality. The staff is also friendly and helpful. All in all, a very professional and effective practice. I highly recommend them! 5 Stars!" "Outstanding care from outstanding people!! Would recommend Drs Robben and Hunstead to everyone....they are true professionals that make you feel at ease from the moment you meet them. 5 Stars!" "I have been a regular customer at Beach Chiropractic for a few years now. Not only does Dr. Robben treat myself, but my dog as well. Over the summer I had a severe low back episode where I was unable to move for days. Dr. Robben and staff got me back on my feet and walking again. Dr. Robben did the same thing for my dog for a rear leg problem. I highly recommend Beach Chiropractic! 5 Stars!" "Great service from the second I walked in the door! Beach Chiropractic offers truly exceptional total care through the expertise and passion of Dr Christa, Dr Eric and Susie, as well as their awesome support staff. 5 Stars!" "I have been seeing Christa for about three years now. She is gentle and effective at keeping my back, neck, and sacrum in line which has helped me tremendously over these past year. My mother also sees Christa as well. We have been very pleased and highly recommend her for your health and chiropractic needs. She has a great team with her as well for massage and acupuncture and her business staff is kind, competent and friendly. 5 Stars!" "Christa is the BEST. She's extremely well rounded and helpful. She genuinely wants to help, unlike any other doctor I've been to. She spent longer with me than any other doctor ever has, explaining my condition, offering knowledge and advice, and getting me fixed up. I highly recommend Beach Chiropractic. 5 Stars!" "This is my go to place when I have back or neck pain. Dr. Christa and Eric get me back to work and surfing in no time. Also, they go to seminars often and keep up with all the new techniques. Very knowledgeable about nutrition. I am so thankful that I found them. 5 Stars!" "I immediately went to Beach Chiropractic when I twisted my ankle surfing last Fall. Dr Robbin did cold laser on me and taped me right up! She also does amazing work on your furry family members too. 5 Stars!" "Dr. Christa Robben and her team do an excellent job. They are very knowledgeable and stay up to date with the latest in treatments and techniques. 5 Stars!" "Full Service of Pain Relief and Great Care. Even some Pet services available. Amazing Staff. 5 Stars!"